In this chapter we will examine the loop programming constructs through which we can execute a code snippet repeatedly. We will discuss how to implement conditional repetitions (while and do-while loops) and how to work with for-loops. We will give examples of different possibilities to define loops, how to construct them and some of their key usages. Finally, we will discuss the foreach-loop construct and how we can use multiple loops placed inside each other (nested loops). In programming often requires repeated execution of a sequence of operations. A loop is a basic programming construct that allows repeated execution of a fragment of source code. Depending on the type of the loop, the code in it is repeated a fixed number of times or repeats until a given condition is true (exists). Loops that never end are called infinite loops. Using an infinite loop is rarely needed except in cases where somewhere in the body of the loop a break operator is used to terminate its execution prematurely. We will cover this later but now let’s look how to create a loop in the C# language. One of the simplest and most commonly used loops is while. In the while loop, first of all the Boolean expression is calculated and if it is true the sequence of operations in the body of the loop is executed. Then again the input condition is checked and if it is true again the body of the loop is executed. All this is repeated again and again until at some point the conditional expression returns value false. At this point the loop stops and the program continues to the next line, immediately after the body of the loop. The body of the while loop may not be executed even once if in the beginning the condition of the cycle returns false. If the condition of the cycle is never broken the loop will be executed indefinitely. Let’s give some more examples in order to illustrate the usefulness of loops and to show some problems that can be solved by using loops. Let’s give another example of using the while loop, before moving on to other structures for organizing loops. We use the variable divider to store the value of a potential divisor of the number. First we initialize it with 2 (the smallest possible divider). The variable maxDivider is the maximum possible divisor, which is equal to the square root of the number. If we have a divisor bigger than √num, then num should also have another divisor smaller than √num and that’s why it’s useless to check the numbers bigger than √num. This way we reduce the number of loop iterations. For the result we use a Boolean variable called prime. Initially, its value is true. While passing through the loop, if it turns out that the number has a divisor, the value of prime will become false. The condition of the while loop consists of two other sub-conditions which are related to the logical operator (logical and). In order to execute the loop, these two sub-conditions must be true simultaneously. If at some point we find a divisor of the number num, the variable prime becomes false and the condition of the loop is no longer satisfied. This means that the loop is executed until it finds the first divisor of the number or until it proves the fact that num is not divisible by any of the numbers in the range from 2 to √num. The break operator is used for prematurely exiting the loop, before it has completed its execution in a natural way. When the loop reaches the break operator it is terminated and the program’s execution continues from the line immediately after the loop’s body. A loop’s termination with the break operator can only be done from its body, during an iteration of the loop. When break is executed the code in the loop’s body after it is skipped and not executed. We will demonstrate exiting from loop with break with an example. - N! = (N-1)! * N, by using the initial value of 0! = 1. // Perform an "infinite loop"
First we initialize the variable factorial with 1 and read n from the console. 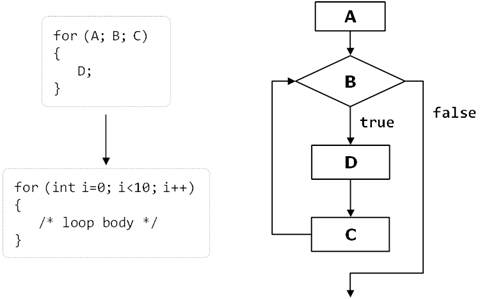 We construct an endless while loop by using true as a condition of the loop. We use the break operator, in order to terminate the loop, when n reaches a value less than or equal to 1. Otherwise, we multiply the current result by n and we reduce n with one unit. Practically in the first iteration of the loop the variable factorial has a value n, in the second – n*(n-1) and so on. In the last iteration of the loop the value of factorial is the product n*(n-1)*(n-2)*…*3*2, which is the desired value of n!. Initially the loop body is executed. Then its condition is checked. If it is true, the loop’s body is repeated, otherwise the loop ends. This logic is repeated until the condition of the loop is broken. The body of the loop is executed at least once. If the loop’s condition is constantly true, the loop never ends. The do-while loop is used when we want to guarantee that the sequence of operations in it will be executed repeatedly and at least once in the beginning of the loop. At the beginning we start with a result of 1 and multiply consecutively the result at each iteration by n, and reduce n by one unit, until n reaches 0. This gives us the product n*(n-1)*…*1. Finally, we print the result on the console. This algorithm always performs at least one multiplication and that’s why it will not work properly when n ≤ 0. Unhandled Exception: System.OverflowException: Value was either too large or too small for a Decimal. If we want to calculate 100! we can use data type BigInteger (which is new as of .NET Framework 4.0 and is missing in the older .NET versions). This type represents an integer, which can be very large (for example 100,000 digits). There is no limit on the size of the numbers recorded in the class BigInteger (as long as you have enough RAM). By BigInteger you can calculate 1000!, 10000! and even 100000! It will take some time, but OverflowException will not occur. The BigInteger class is very powerful but it works many times slower than int and long. For our unpleasant surprise there is no class "big decimal" in .NET Framework, only "big integer". In the example code we consecutively assign to num at each iteration the values n, n+1, …, m and in the variable product we accumulate the product of these values. We require the user to enter n, which should be less than m. Otherwise we will receive as a result the number n.
Be careful: the product grows very fast, so you may need to use BigInteger instead of long for the calculated result. Also beware of hidden integer overflow. Unchecked code will silently overflow and the code above will produce incorrect output instead of showing an error. To overcome this, you may surround the line holding the multiplication by the checked keyword. It consists of an initialization part for the counter (in the pattern int i = 0), a Boolean condition (i < 10), an expression for updating the counter (i++, it might be i-- or for instance, i = i + 3) and body of the loop. The counter of the loop distinguishes it from other types of loops. Most often the counter changes from a given initial value to a final one in ascending order, for example from 1 to 100. The number of iterations of a given for-loop is usually known before its execution starts. A for-loop can have one or several loop variables that move in ascending or descending order or with a step. It is possible one loop variable to increase and the other – to decrease. It is even possible to make a loop from 2 to 1024 in steps of multiplication by 2, since the update of the loop variables can contain not only addition, but any other arithmetic (as well as other) operations. Now let’s consider in details the separate parts of a for-loop. It is executed only once, just before entering the loop. Usually the initialization block is used to declare the counter-variable (also called a loop variable) and to set its initial value. This variable is "visible" and can be used only within the loop. In the initialization block is possible to declare and initialize more than one variable. 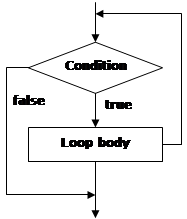 The condition (loop condition) is evaluated once before each iteration of the loop, just like in the while loops. 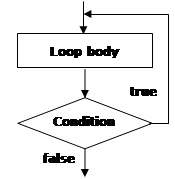 For result true the loop’s body is executed, for result false it is skipped and the loop ends (the program continues immediately after the last line of the loop’s body). This code is executed at each iteration, after the loop’s body has been executed. It is most commonly used to update the value of the counter-variable. The body of the loop contains a block with source code. The loop variables, declared in the initialization block of the loop are available in it. First we initialize the result (result = 1). The loop starts by setting an initial value for the counter-variable (int i = 0). We define the condition for the loop’s execution (i < m). This way the loop will be executed from 0 to m-1 i.e. exactly m times. During each run of the loop we multiply the result by n and so n will be raised to the next power (1, 2, …, m) at each iteration. Finally we print the result to see if the program works properly. The continue operator stops the current iteration of the inner loop, without terminating the loop. With the following example we will examine how to use this operator. First we initialize the loop’s variable with a value of 1 as this is the first odd integer within the range [1…n]. After each iteration of the loop we check if i has not yet exceeded n (i <= n). In the expression for updating the variable we increase it by 2 in order to pass only through the odd numbers. Inside the loop body we check whether the current number is divisible by 7. If so we call the operator continue, which skips the rest of the loop’s body (it skips adding the current number to the sum). If the number is not divisible by seven, it continues with updating of the sum with the current number. The foreach loop (extended for-loop) is new for the C/C++/C# family of languages, but is well known for the VB and PHP programmers. This programming construct serves to iterate over all elements of an array, list or other collection of elements (IEnumerable). It passes through all the elements of the specified collection even if the collection is not indexed. We will discuss arrays in more details in chapter "Arrays", but for now we can imagine one array as an ordered sequence of numbers or other elements. After initialization of the first for loop, the execution of its body will start, which contains the second (nested) loop. Its variable will be initialized, its condition will be checked and the code within its body will be executed, then the variable will be updated and execution will continue until the condition returns false. After that the second iteration of the first for loop will continue, its variable will be updated and the whole second loop will be performed once again. The inner loop will be fully executed as many times as the body of the outer loop. Let’s now consider a real example that will demonstrate how useful the nested loops are. - We increase the loop variable with one unit at each iteration of the internal loop. Basically, we need to implement a for-loop (external) from 1 to n (for the lines) and put another for-loop (internal) in it – for the numbers on the current line, which should spin from 1 to the number of the current line. The external loop should go through the lines while the internal – through the columns of the current line. Note: when n > 9 the triangle will have a small defect. Think how to fix it! Using the outer for-loop we check each of the numbers n, n+1, …, m if it is prime. At each iteration of the outer for-loop we check whether its loop variable num is a prime number. The logic by which we check for a prime number is already familiar to us. At first we initialize the variable prime with true. With the internal while loop we check for each of the numbers [2…√num] if it is a divisor of num and if so, we set prime to false. After finishing the while loop the Boolean variable prime indicates whether the number is prime or not. If the number is prime we print it on the console. We leave as homework for the diligent reader to offer a more efficient solution to the same problem, using only three nested loops rather than four. Everything looks correct. Let’s run the program. It seems to work but there is one problem – there are too many combinations and the program does not end (it is so slow, that hardly anyone is going to wait). This is correct and it is one of the reasons why there is Lottery 6/49 – there really are lots of combinations. We are leaving the curious reader to practice changing the example above just to calculate all lottery combinations, instead of printing them. This change will dramatically reduce the volume of the printed results on the console and the program will end surprisingly quickly. Printing excessive amount of text on the console is very slow and should be avoided. A modern computer (as of 2012) can perform 300,000,000 operations per second but can print only 10,000 – 20,000 text lines per second. 1. Write a program that prints on the console the numbers from 1 to N. The number N should be read from the standard input. 2. Write a program that prints on the console the numbers from 1 to N, which are not divisible by 3 and 7 simultaneously. The number N should be read from the standard input. 3. Write a program that reads from the console a series of integers and prints the smallest and largest of them. 4. Write a program that prints all possible cards from a standard deck of cards, without jokers (there are 52 cards: 4 suits of 13 cards). 6. Write a program that calculates N!/K! for given N and K (1<K<N). 7. Write a program that calculates N!*K!/(N-K)! for given N and K (1<K<N). 8. In combinatorics, the Catalan numbers are calculated by the following formula: , for n ≥ 0. Write a program that calculates the nth Catalan number by given n.
12. Write a program that converts a given number from decimal to binary notation (numeral system). 13. Write a program that converts a given number from binary to decimal notation. 14. Write a program that converts a given number from decimal to hexadecimal notation. 15. Write a program that converts a given number from hexadecimal to decimal notation. 16. Write a program that by a given integer N prints the numbers from 1 to N in random order. 17. Write a program that given two numbers finds their greatest common divisor (GCD) and their least common multiple (LCM). You may use the formula LCM(a, b) = |a*b| / GCD(a, b). 2. Use a for-loop and the operator % for finding the remainder in integer division. A number num is not divisible by 3 and 7 simultaneously exactly when (num % (3*7) == 0). 3. First read the count of numbers, for example in a variable n. Then consequently enter n numbers with one for loop. While entering each new number, save in two variables the smallest and the largest number until this moment. At the start initialize the smallest and the largest number with Int32.MaxValue and Int32.MinValue respectively. 4. Number the cards from 2 to 14 (these numbers will match the cards 2, 3, 4, 5, 6, 7, 8, 9, 10, J, Q, K, A). Number the suits from 1 to 4 (1 – club, 2 – diamond, 3 – heart and 4 – spades). Now you can use the two nested loops and print each of the cards with two switch statements. 5. Fibonacci numbers start from 0 and 1, each additional is obtained as the sum of the previous two. You can find the first n Fibonacci numbers with a for-loop from 1 to n, and at each iteration calculate the next number by using the previous two (which you will keep in two additional variables). 6. Multiply the numbers from K+1 to N (think why this is correct). You may check the properties of the factorial function in Wikipedia: http://en.wikipedia.org/wiki/Factorial. 7. One solution is to calculate separately each factorial and at the end to perform the respective operations with the results. Think how you can optimize the calculations, in order to not calculate too many factorials! In fractions of factorials there are many possibilities to reduce the same factors in the numerator and denominator. These optimizations will not only reduce the calculations and increase the performance but will save you from overflows in some situations. You might need to use arrays num[0..N] and denum[0..n] to hold the factors in the numerator and in the denominator and to cancel the fraction. You may read about arrays in the chapter “Arrays”. 8. Use the same concept of canceling the faction of simple factors, like you probably did in the previous problem. You may also read more about the Catalan numbers in Wikipedia (http://en.wikipedia.org/wiki/Catalan_number) and use the recurrent formula for calculating them. 9. You can solve the problem with a for-loop for k=0…n, by using three additional variables factorial, power and sum in which you will keep for the kth iteration of the loop respectively k!, xk and the sum of the first k members of sequence. If your implementation is good, you should have only one loop and you should not use external functions to calculate factorials and to raise power. 10. You should use two nested loops, similar to the problem "Printing a Triangle". The outer loop must run from 1 to N, and the inner – from the value of the outer loop to the value of the outer loop + N - 1.
wiki/Numeral_system. After that consider how you can convert numbers from decimal numeral system to another. Think about the opposite – moving from another numeral system to decimal. If you have difficulty, see the chapter "Numeral Systems". 13. See the previous problem. 14. See the previous problem. 15. See the previous problem. 16. Search in the Internet for information about the class System.Random. Read in the Internet about arrays (or in the next chapter). Create an array with N elements and write in it the numbers from 1 to N. After that a few times (think exactly how many) swap two random pairs of elements from the array. 17. Search the Internet for the Euclidean algorithm for calculation the greatest common divisor (CGD) or read about it in Wikipedia: http://en.wikipedia.org/wiki/Euclidean_algorithm. 18. You should use a two-dimensional array (matrix). Search the Internet or see the chapter "Arrays". The algorithm of filling a spiral matrix in not straightforward and may require a bit of thinking. You might find helpful the “Spiral Matrix” problem from chapter “Sample Programming Exam – Topic #3”. Download the demo examples for this chapter from the book: Loops-Demos.zip. Comment the book and the tasks in the : forum of the Software Academy. Did Exercice number 11 may be answered as I do?